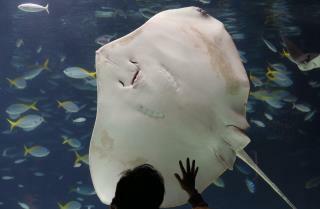 (Newser) – In what police are calling the first death of its kind in Singapore, a longtime professional diver was killed by a stingray Tuesday at a shuttered aquarium, the BBC and Reuters report. Philip Chan, 62, who'd worked at Underwater World since it opened its doors in 1991, was the venue's head diver until it closed down in June, the victim of competition with other local aquariums, but he had stayed behind with nearly a dozen other workers to care for the animals while new homes for them were sought, says a spokesperson from Haw Par Corporation, the aquarium's parent company. Per the New Paper, police say they responded to a call about an injured man shortly after 2pm Tuesday, and he died after being taken to a local hospital. A Haw Par statement says Chan was struck in the chest by the stingray, reports the Independent. The poor thing just had enough of her prison. Maybe zoos and aquariums should be rethought.